Elvis Presley was an American singer, songwriter, and movie actor. 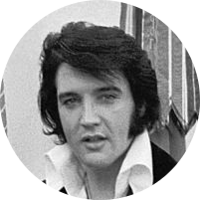 He is arguably the most significant cultural icon of the 20th century who is commonly referred to as “The King of Rock & Roll.” Elvis won three Grammy Awards and had numerous #1 album and solo hits. He is said to be the best-selling solo artist of all-time and is still currently one of the top selling dead artists. Elvis Presley is related to at least two former U.S. Presidents, Abraham Lincoln and Jimmy Carter. He also has a kinship to Robert Townsend, a member of the Culper Spy Ring that operated during the American Revolutionary War. Robert Townsend was Elvis Presley's 4th cousin 6 times removed. He was a member of the Culper spy ring during the American Revolutionary War. His involvment in the spy ring was kept secret until New York historian Morton Pennypacker discovered it in 1929. Pennypacker was able to use handwriting analysis to reveal that the mysterious spy known as Samuel Culper, Junior, was in fact Robert Townsend. The Culper Spy ring is said to have been instrumental in the disclosure of the Benedict Arnold and John Andre plot to surrender West Point and the attempted capture of General George Washington in 1780.